I love that in the book of Daniel, we see that “Daniel was determined not to defile himself”. He risked being judged and even killed because of his strong conviction to remain faithful to God, even when his beliefs didn’t agree with the ways of the world around him. Daniel didn’t take the easy road of “man’s way”, he didn’t choose the broad easy way that leads to destruction but instead chose a life surrendered to faithfully following his master’s will and purpose for his life. 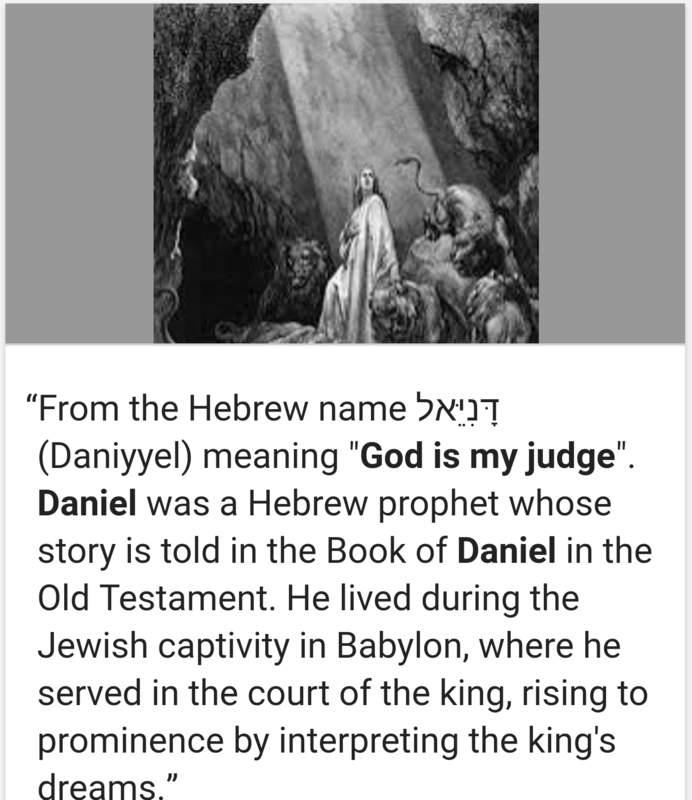 The book of Daniel (whose name literally means “God is my judge”) shows us a beautiful example of his faithful obedience even when facing extreme circumstances. Daniel wouldn’t even take credit or honor from others for interpreting the dream, but he gave God all the honor and credit for it. Yes, Daniel is a wonderful example of how a life dead to self and surrendered to God’s will has little to fear from God as judge when God is leading His servant’s steps. As the king said to Daniel, “May your God whom you serve so faithfully, rescue you. ” But it also demonstrates clearly that those in opposition to God’s will, when facing the same Lion’s den will find that “it is a terrible thing to fall into the hands of the living God.”(Hebrews 10:31) – as we see those men who were his accusers went into the same Lion’s den, “along with their wives and children to be devoured by the lions”. So this cry, “God is my judge” should bring comfort to the true believer who has not deceived themselves. As James 1 tells us “Do not merely listen to the word, and so deceive yourselves. Do what it says.” And as Philippians 2 reminds us “Therefore, my dear friends, as you have always obeyed–not only in my presence, but now much more in my absence–continue to work out your salvation with fear and trembling,” Such a cry should both convict us to confession and repentance that draws us closer to the Lord, and should remind us as Ecclesiastes 7 tells us that “It is better to heed the rebuke of a wise person than to listen to the song of fools.” So we don’t find ourselves in pride. Lord, don’t let us use the cry “God is my judge!” to excuse ourselves from understanding your Word, remembering your sacrifice, laying down our lives, and following you. Lord, don’t let us use the disguise of religious words and practices as an attempt to hide from receiving you into our lives to abide and live and influence our thoughts, words, and actions. Lord, don’t let us forget that you are a holy and righteous God and that only a true, abiding faith can offer us that blessed assurance of being washed by the blood of the Lamb as a new creation, born again as a child of God. Lord, remind us of your purpose and will for our lives today, now, and the importance of our stepping into these good works that you have set before us rather than being a stumbling block to others. Lord, train us, equip us, and send us out as your vessels for your work, walking in the Spirit not in the flesh, bearing the fruit of your very character and nature in our lives – spreading Hope, Faith, and Love in a dark and fallen world that would love to steal our joy and minimize the impact of your Kingdom come, your will being done on earth as it is in heaven. Teach us to endure sound doctane and to be doers of your Word and not just hearers. Amen.